Our third 'Chloe' bottling delivers signature DuMOL intensity, texture and balance with a lineage that can be traced through all three bottlings. In contrast to our Burgundian 'Isobel' release, this limited cuv_e is more powerfully Californian in density, texture and weight. Kent Ritchie's old vine Forestville vineyard provides the core to the blend: rich baked apple, toasty brioche and full-bodied leesy extract. This is underpinned by Dutton's Sullivan Vineyard which explodes with Green Valley fruit intensity at its finest: sweet limes, mineral concentration and bright acidity. 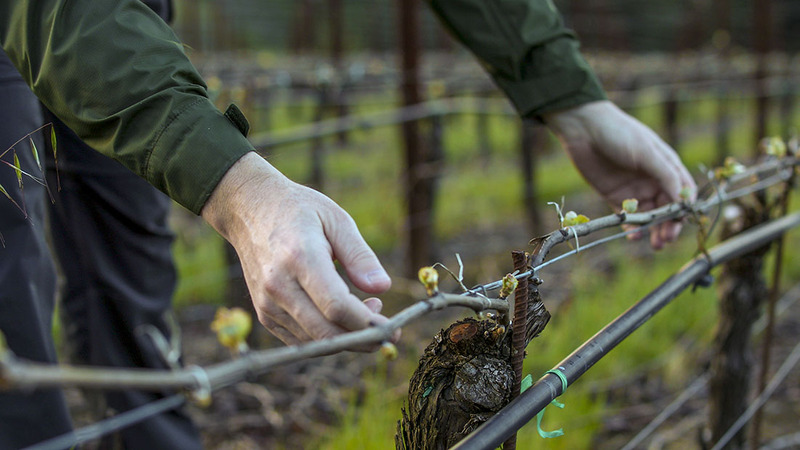 These old vine sources provide a perfect foil to each other and result in a blend that reflects the diversity that the Russian River has to offer. These were our first two vineyards to harvest in 2002. They both ripened early due to specific site characteristics and moderate yields. Kent Ritchie's undulating hillside vineyard offers great exposure, excellent drainage and Old Wente clone pedigree. Sullivan Vineyard is an east-facing gentle slope that escapes the full glare of the warmer afternoon sun preserving fruit intensity and structure. Both sites are non-irrigated and intensively farmed to produce small berries bursting with fruit intensity, but with an eye toward acid retention. Perfect for a full-bodied yet balanced chardonnay style, their Old Wente clonal heritage is reflected in the sophistication of the wine's balanced structure. Native yeast fermented over a four month period, both lots completed full malolactic in late spring and were lees stirred for 8 months to emphasize texture but limit undesirable butterscotch flavors. The blend was made after 13 months and returned to barrel for an additional three months to integrate and clarify prior to unfiltered bottling. Aromas of sweet citrus, baked apple and warm bread are offset with peripheral notes of sweet vanilla pod and nutmeg. The palate is initially bright and focused with minerals, piercing lime and fresh peach. A sweet core of bruised apple, pear and lemon curd unfolds to a richly textured layered mid-palate of oatmeal, baking spice and smoke. The finish is long and penetrating with snappy fresh acidity. A great example of old vine extract and cool climate structure, our 2002 'Chloe' bottling will improve in bottle for 2 to 3 years as the viscosity of the wine concentrates. Drink over the next 6 years and serve at no cooler than 55 degrees.